9) Hall of Presidents – Many guests who visit Liberty Square in the Magic Kingdom head straight for the beloved Haunted Mansion where frightful ghosts wait to cause all sorts of eerie happenings. However, there is another attraction in the area that often times gets overlooked making it a great option on a crowded day in the park. The Hall of Presidents is housed in a beautiful colonial style building that immediately creates a sense of patriotism. The lobby of the attraction is home to wonderful exhibits that share details about the lives of the presidents as well as the only presidential sea on the carpet to exist outside of the White House. Once seated inside the beautiful theater, guests can enjoy an exploration of the history of the presidential office, presented through narration, photographs, artwork, and more. 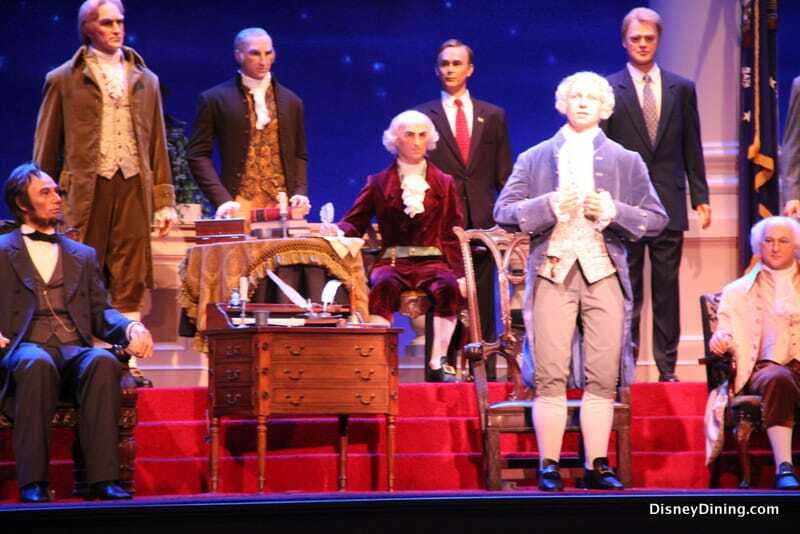 The real highlight of the show comes at the end when the curtain rises and each President of the United States is represented on stage as an audio-animatronic. The current president stands near the center, takes the Oath of Office, and delivers a short speech before a dramatic conclusion to the show. The Hall of Presidents is a great attraction in the Magic Kingdom, especially on a crowded day, as it allows guests to enjoy a wonderful experience from the comfort of an air conditioned theater.